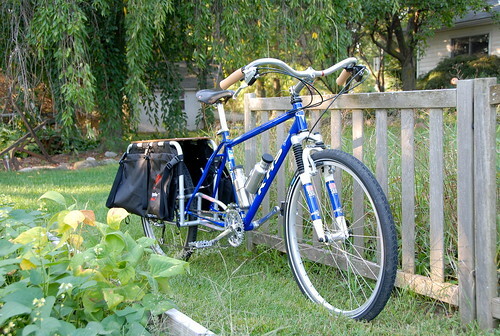 The completed Xtracycle. I converted the KHS Summit X into an Xtracycle Cargo Bike using the Free Radical frame and the Freeloader kit. 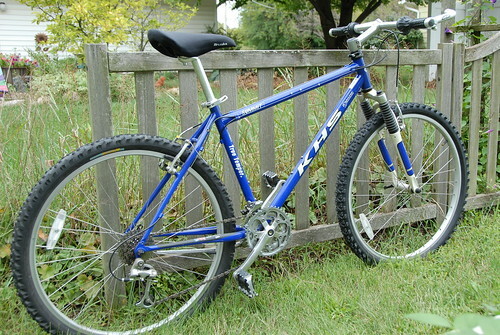 I also changed the knobby mountain bike tires to Schwalbe Big Apple 26 X 2.0 tires, added the bottle cages, put on my Nitto Albatross bars from my Bridgestone RB-T, changed from Sachs twist grips to Shimano brake/shift lever combo and added cork grips. I swapped the imitation "Brooks gel saddle to an old Selle San Marco Regal perforated leather saddle. UPDATE: Lots of changes since this was originally posted. I replaced the suspension fork with a Surly 1X1, which made for a much more stable platform. I've got Wideloaders for both sides, and a cooler to fit the bags. I've again swapped saddles; this time to a black Brooks B68 Imperial. My daughters gave me the Magic Carpet and the Foot Pads for when they ride with me. And I've added Planet Bike fenders, a blink tail light, and a Philips SafeRide headlamp. Still love the Xtracycle! It is my most used bicycle.